What could be better than our sweet, juicy, dried fruit morsels? Baking them inside delicious all-natural cookie dough! Our new colossal cookies are made by a local, family-owned bakery in the Pacific Northwest with a long-standing reputation for premium, small batch baking. 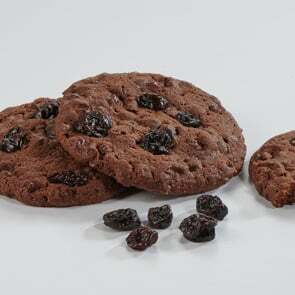 Double Chocolate Cherry Cookies are soft and chewy, loaded with bittersweet chips and Montmorency cherries. This combination is hard to resist! Large 2 oz. cookies, 1lb., 8oz. Shop for the finest dried fruit gift baskets and dried fruit treats today at Meduri World Delights.